bwb2_new.stl: This is the STL file that you will import into Stallion 3D. bwb2.vsp: The NASA OpenVSP file that can be modified in OpenVSP version 2. This file might not be readable in version 3 of OpenVSP. bwb1.sur: The Stallion 3D project file. This file contains the problem outlined below. Read it into Stallion 3D using the File menu and the Open Project option. Please here to download the example project. 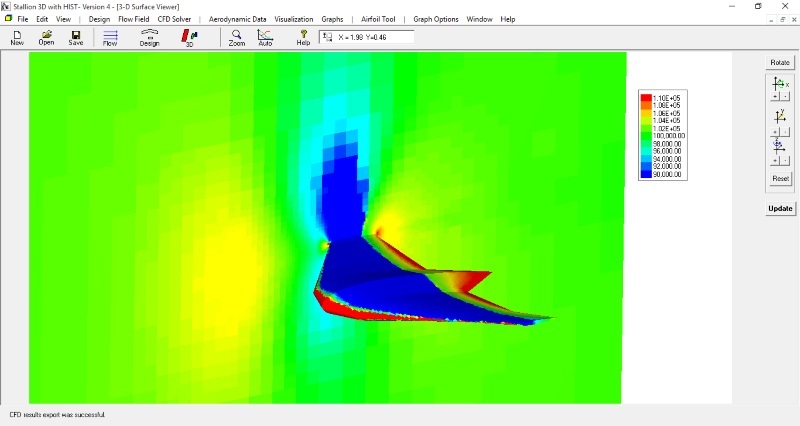 To import the Blended Wing Body (BWB) STL file for your analysis, click the Design menu and choose the Import/Edit STL File option. 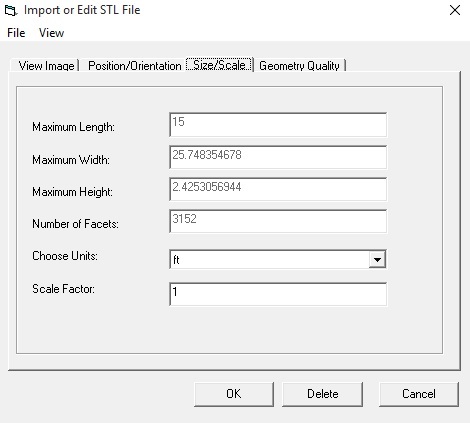 This will invoke the Import or Edit STL File dialog box. Click the File menu (on the dialog box) and then import the .stl flie. It should appear as shown in the figure above. Use the arrows (Rotate) to rotate the file in the flow direction (if necessary). Use the Top, Side and Front buttons to adjust the view while you orientate the geometry. You can change the amount of rotation from 90 degrees to any number. Note: Stallion 3D will read only the ASCII format of the .stl file. The file can have a size of up to 100,000 facets. Choose Units: Set Choose Units to ft. Scale Factor: Should remain as 1 for this case. Un-check the Geometry has Holes and Reverse Surfaces option (unless of course the geometry has holes and reverse surfaces). 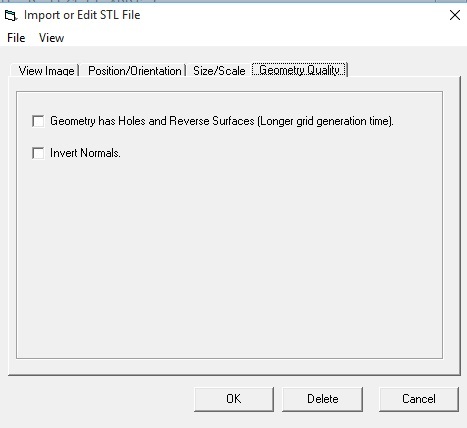 If it does, this option will mitigate the solution process for not-so-perfect CAD files but the grid generation process will take longer to complete. Click OK to exit and import the geometry in Stallion 3D. Once the geometry is imported, click the Visualization menu and choose the View Geometry (Only) option. This will produce a 3D rendering of your geometry (as shown below). 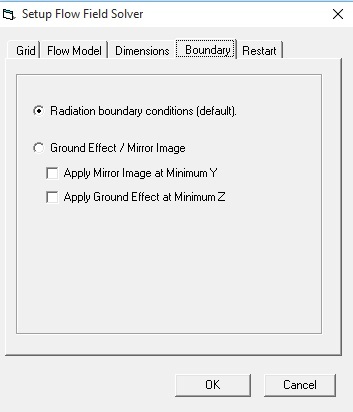 To invoke the Flow Field Conditions dialog box, please click the Flow Field menu and select the Flow Parameter option. You may also click the Flow button. Angle of attack: set to 2 degrees. Use the slider or enter the value into the box. For more than 20 degrees and non-integer values, you have to enter the values into the box. Side slip angle: set to 0 degrees (no side slip). Fluid type: Air : Set the altitude to 0 feet. For other fluid types, including water, click the Fluid Type: other option. 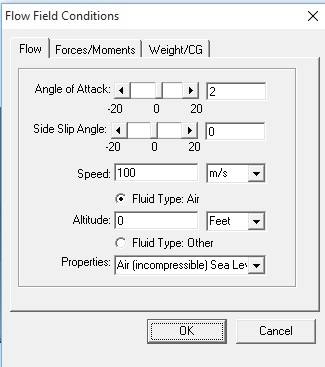 Fluid Type: Other: Use the Air (incompressible) option to simulate low speed air. This will allow the solver to mitigate for incompressible air and speed up convergence. Use this option if the speed of the vehicle is less than 70 m/s. In addition, the drop-down box has options for water, sea-water and other atmospheres. Reference Area: 190.2 sq. ft. The reference area is needed to calculate the lift, drag and moments coefficient. The force and moment magnitudes are computed directly from the geometry and pressure values. Moment Ref. Length: 7.76 ft. This dimension is needed to compute the moment coefficients. Force Units: Pounds. Please use the drop-down box to select other options. Length Unit: meters. Use the drop-down box to select other options. Speed Unit: This is set in the Flow Tab (above). X-Distance: 0 meters. This is the distance of the x-coordinate of the CG or Datum point. The moments/moment coefficients are computed about the CG reference point. The location of this point can be change to compute the moment about any location. Z-Distance: 0 meters. The distance of the z-coordinate of the CG. The above coordinates, places the CG at the origin of the x-y-z coordinate system. To invoke the CFD Setup dialog box, please click the CFD Solver menu and select the Setup CFD Solver option. Model Size: Less than 480,000 Cells. Use up to 4 million cells. A good place to start is 480,000. The next step up is about 2,000,000 cells. Initial X-Divisions: 4. The initial grid will start at 4 divisions x or flow direction. Initial Z-Division: 4. This will generate the same resolution in the z or vertical direction as the flow or x-direction. Note: for really high aspect ratio wings, set x-division and z-division to 6 while setting the y-division to 2. Near-Body Cells to Split: 3. This works well for airplane applications for good lift and drag values. Reynolds Averaged Naiver-Stokes (RANS)/k-e model. Solve the Reynolds averaged N-S equations with the K-epsilon model. Other choices are the Euler equations and laminar N-S equations. Select Solver: 2nd Order FVS. Use the second order Flux Vector Splitting algorithm to solve the problem. Number of Iterations: 3500. This should be a good for lower number of cells. 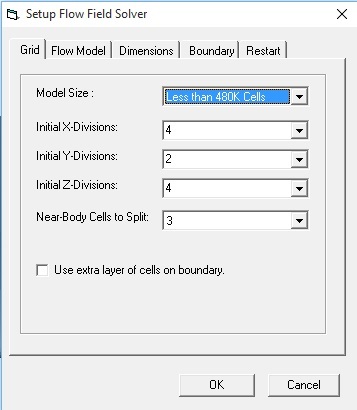 For high cell counts, use 7500 or more iterations. Minimum X: -10 meters. This is the x location of the most up-stream, lower and left most corner of the cube. For simplicity, setting the X, Y and Z locations to half the length and negative fixes the the geometry near the center of the cube. Click Save incremental solution to a restart file. This is useful if the computer stops during the simulation. The restart file saves the results up to the point of the computer failure. This is a hands-off process where the software generates the grid based on your specifications and geometry. This process will take from a few minutes to hours depending on the size of the mesh and the number of geometry (STL) facets. It will run on a single core. The software will inform you of its progress. Once the grid generation process is completed, Stallion 3D will automatically launch the Flow Solver. Flow Solver 4.0 is a separate program from the Stallion 3D main program. It solves either the compressible Euler, Laminar Navier-Stokes or Reynolds Averaged Navier-Stokes equations for your problem. The software will utilize up to eight cores to analyze your problem. 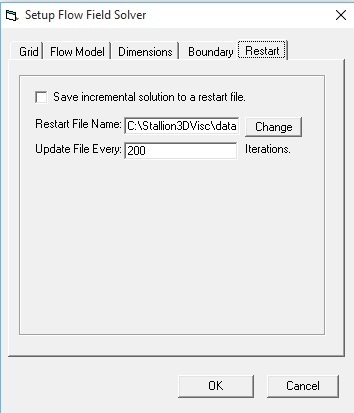 Flow Solver 4.0 reports back to Stallion 3D with the intermediate solution after every 50 iterations. After the first 50 iterations, you will be able to see the solution in Stallion 3D. 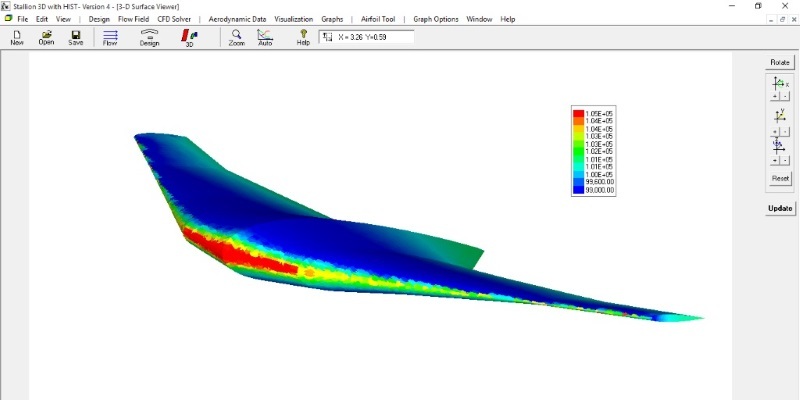 You can generate the aerodynamics reports and and flow field plots for the intermediate solutions. 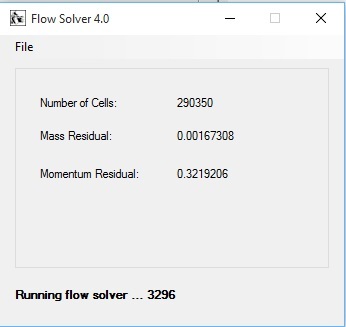 Flow Solver 4.0 shows the number of cells, the current L2 norm of the mass and momentum residuals. While Flow Solver 4.0 is running, Stallion 3D will show the latest results. The most recent iteration number is shown in Stallion 3D status bar. 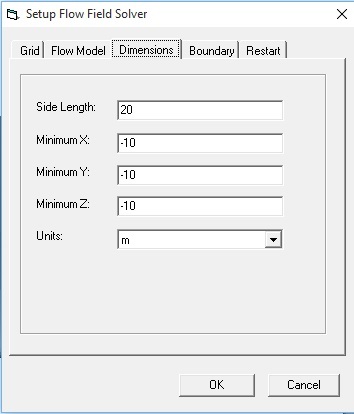 To Stop the Flow Solver from running, click the CFD Solver menu and then choose the STOP Solution option. To Resume the solution, click the CFD Solver menu and then choose the Resume Solution option. To save the CFD solution, please click the CFD Solver menu and then choose the Save CFD Results option. Note, it is recommended that you Stop the solution before you decide to save it. To recall a previous CFD solution, please click the CFD Solver Menu and then choose the Open CFD Results option. This will load an entire previous case into Stallion 3D. This includes the geometry, settings and the current CFD results. After Stallion 3D status bar shows at least 50 iterations, you will be able to view the solution. Click the Visualization menu and then choose View 3D Solution. This will produce a surface plot of the pressure as shown below. 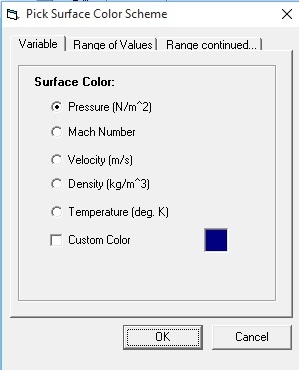 If you wish to look at other variables such as velocity, Mach number or temperature, please click the Visualization menu and then choose Surface Color Options. This will invoke the Pick Surface Color Scheme dialog box shown below. 1. Select the flow color that you wish to display on the surface. Here, the pressure is chosen. 2. Check the Custom Color box if you wish to display the surface as a solid color. The flow field and the streamlines will retain the colors based on the selected flow variable. Select Pressure. The color range is used to select the minimum value for the flow variable and is displayed in blue. The maximum value is displayed in the color red. Manual. 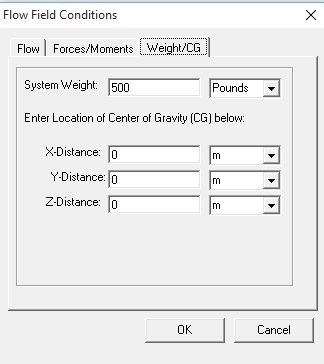 Manually select the upper and lower bounds of the flow variable. Two addition variables can be selected using the Range continued tab. 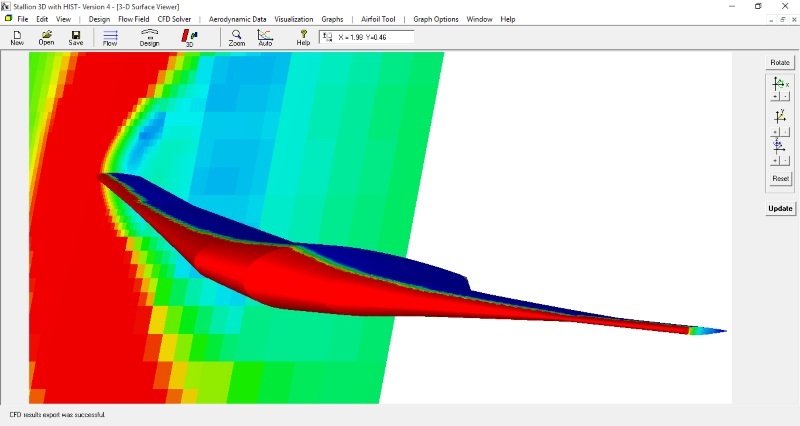 Stallion 3D computes the aerodynamics data based on your angle of attack, speed, quasi-steady rotation and location of the CG or datum point. 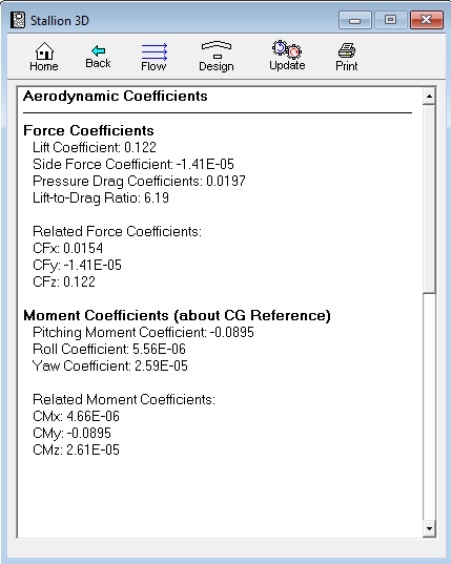 To display the aerodynamics coefficients, click the Aerodynamics Data menu and then choose the Aerodynamic Coefficients option. The coefficients are based on the computed forces normalized with respect to the reference area and length. 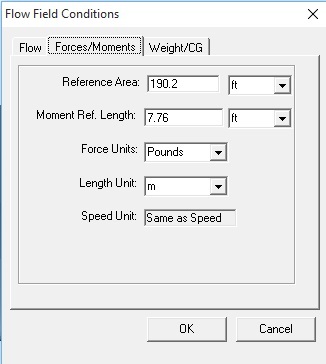 These quantities are entered in the Flow Field Conditions dialog box under the Forces/Moments tab. 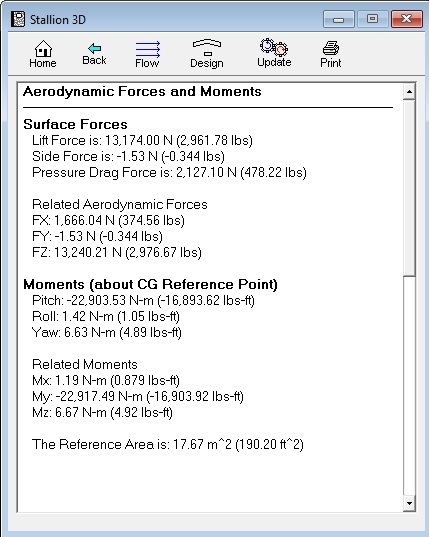 To compute the aerodynamic forces and moments, click the Aerodynamic Data menu and then choose the Aerodynamic Forces option. The aerodynamic forces are based on the exact size of the model, the speed and angle of attack. To set and view streamlines, click the Visualization menu and then choose the View Edit Streamlines option. Rake Id: this is the current rake. You can add a number of rakes for your visualization needs. It is a good idea not to set more than 10. X1, Y1, Z1: The coordinates of the first rake point in distance from the origin (the units are meters). X2,Y2, Z2: The coordinates of the second rake point in distance from the origin. Number of Streamlines: Set the number of streamlines (21 in this case). Streamline colors: Select custom color (black). You also have the option to set the flow colors. 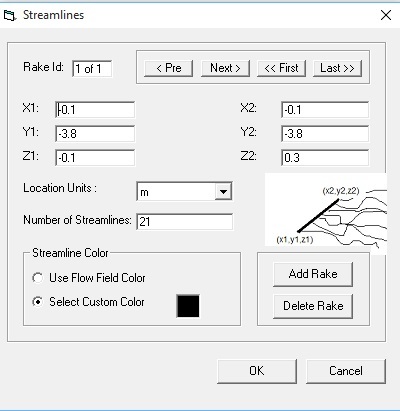 This option will change the streamline color based on the flow variable. Note: To turn off the streamlines, set the number of streamlines to zero (0). 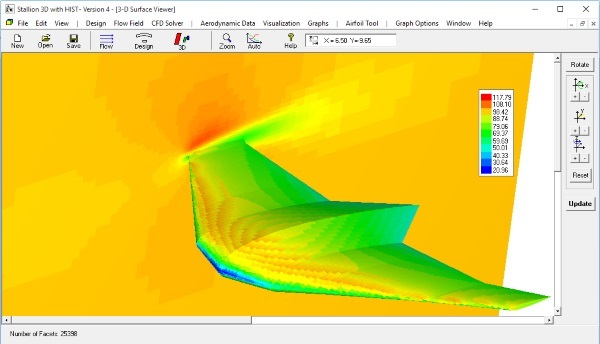 To view the streamlines, click Update button on the 3D Surface Viewer. This will redraw the 3D image and it will include the streamlines. The streamlines can take some time to draw. 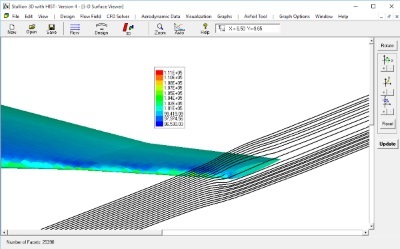 We recommend that you do not draw streamlines while the Flow Solver is running. To view a cross section of the flow field, please click the Visualization menu and then choose the View Flow Planes (Slices) option. The plane viewer dialog box allows you to see various planes in Stallion 3D. Plane to view: X-Z Plane. Other choices are the X-Y plane and the Y-Z plane. X-Location: 0 meters. 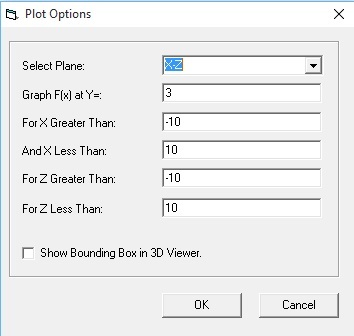 Choose the x-location for viewing the y-z plane. Y-Location: 3 meters. 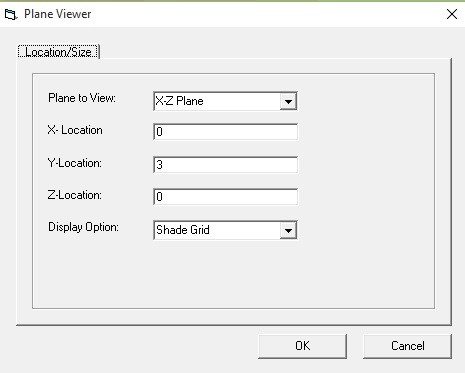 Choose the y-location for viewing the x-z plane. In this example, we are looking at the 3 meters location from the origin (along the wing span, see the figure below). Z-Location: 0 meters. Choose the z-location from which to view the x-y plane. Display Option: Shade Grid. Choose the Shade Grid option to see the color contours. Use the Hide Plane option to remove the flow plane from the 3D viewer display. Finally click the OK button to retain the desired settings. 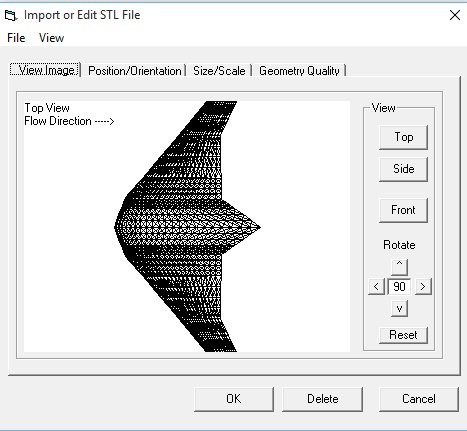 To view the flow plane, click the Update button on the 3-D Surface Viewer screen. Stallion 3D will graph the surface pressure coefficients and other variables at various wing stations. To set the location, please click the Graphs menu and then choose the Surface Graph option. The Plot Option allows you to choose the location along the wing. 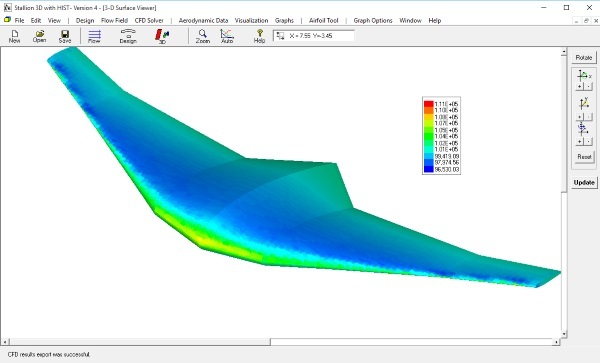 This tool is useful to graph and save the values of the pressure coefficient at the upper and lower surface at various locations along the wing. Select Plane: Select the X-Z plane for various choose the values along the wing span (y direction). Graph F(x) at Y=: Choose the y-location of the span station of interest. For x Greater Than/And X Less Than: Choose the range of x-values. For Z Greater Than/And Z Less Than: Choose the range of z-values. 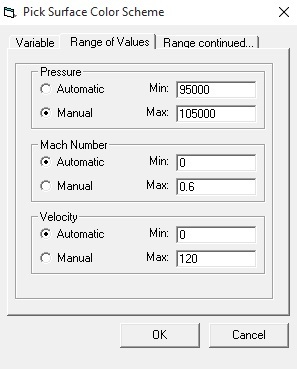 To view the graph, click the Graphs menu and then choose the Pressure Coefficient (Cp) option. This will display the above graph. 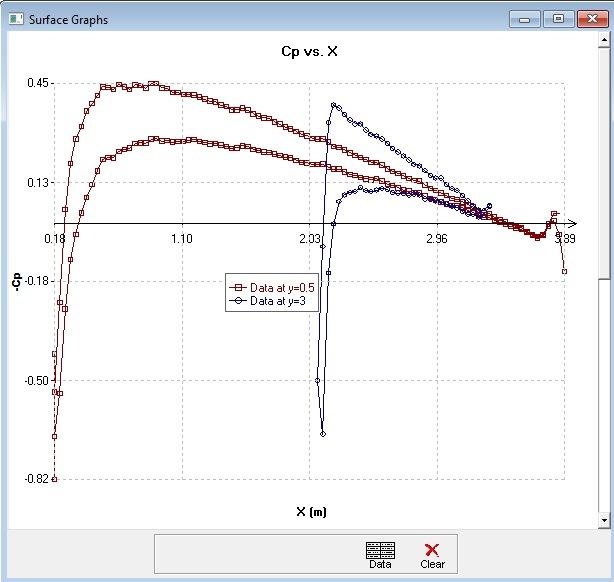 To view and save the data, click the Data button at the bottom of the Surface Graphs screen. Other cases can be run on the same geometry without generating a new grid. For example, you can change the speed, angle of attack, side-slip angle and quasi-steady rotations without generating a new grid. To run another case first save the current CFD solution, click the CFD Solver menu and then choose the Save CFD Results option. Next, enter the changes to the flow field by clicking the Flow button. 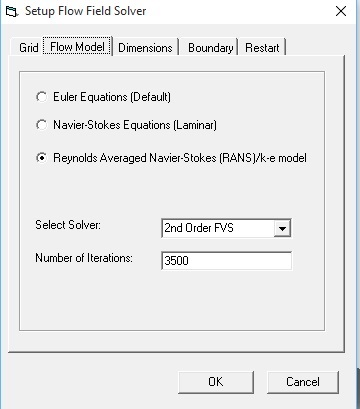 Finally click the CFD Solver Menu and then choose the Solve Flow (From Initial Conditions) option. This will restart the solution from first iteration using the current grid and the changes to the flow condition. Case 2: Speed set to 300 meters per second (pressure shown). Case 3: Speed set to 600 meters per second (pressure shown). More information can be obtained by reading the following tutorials or calling/texting us at (352) 653-0875.